In the world of stabilizers, Scotts Stabilizers are known for being one of the best options for smoothing out steering feedback, maintaining control at high speeds, and calming down a twitchy front end. With the Scotts Performance SUB Mount Complete Stabilizer Kit, you get the above benefits in a complete kit that’s ready to install under your 1 1/8th inch bars. SUB (stabilizer under bar) stabilizers were originally meant to be run with a bar riser, but thanks to Scott’s clever design, this stabilizer fits underneath your fat bar using your stock triple clamps and the included hardware/mounts that come in the kit. This gives your bike a clean looking cockpit along with more room above the bars for things like GPS or a bar pad. Overall we can’t recommend the Scotts Performance SUB Mount Complete Stabilizer Kit enough. The mounting position is sleek, adjusting the damper is super easy, and the quality and machining are top notch. With Scott including everything needed for your machine specific stabilizer (including detailed instructions), this kit is one of the best ways to get confident steering in short order. SUB mount kit comes equipped for 1 1/8" handlebars, for 7/8" handlebars use part #1580070001 to accommodate the smaller diameter bar. I've heard for years how good the Scotts stabilizer was but up until recently I hadn't used one. The first trip on my 701 with deep sand I knew I needed one. It bolted right on and I quickly forgot it was there. The only time I remember is after a ride when someone says "you did great in that deep sand" and I think back to how much harder I had to grip the bars before the stabilizer. Very happy with the results but wish it were cheaper. The machining ect. is all top notch and I don't feel like they are overcharging for what your getting. Its just not cheap. Install was no problem. Actually gave us an excuse to go ahead and grease the bearings. Had to relocate the hand guards but that was to be expected. Over all a great purchase. 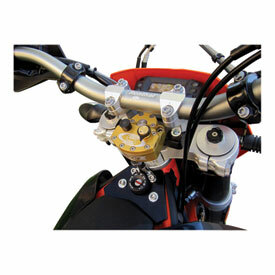 this mounting system limits the handlebar adjust ability to one position! Which isn't stated in the description. So if you go from the forth position back to the second position it is kinda a big sacrifice for such an expensive product. That being said the damper/mount functions unbelievably well and looks great. Awesome! Every bike should have. Great product! It took about 45 minutes to install. Every part fit perfectly and is easy to set up. One of the best investments you can buy. It's a little pricey as all of them are, but to me it's worth it. Scotts is awesome. High speed death wobbles gone. Mounting is easy and fit perfectly. This is the first sub mount system I have used and am extremely happy with it. Not only does the stabilizer make running through the soft stuff easier, the mount raised the handle bars. This makes riding in the standing position much more comfortable. Every desert ride should have this, especially on a lightweight bike. Makes a world of difference and makes riding safer. My friends always talk about how much they love their stabilizers. I personally never felt like I needed one. I bought a 2017 huasqvarna tx 300 and found that I needed one. I love this product. It took away the major wheel deflection I was experiencing.ider whether you would recommend this product and what you like or dislike about it. Scott is ben in the market for 20 + years the first time I used was in a XR650R for racing bajas, Scott Stabilizer keep me away from a lot potential accidents, I recommended 100% it always fit and performs perfect. Works well for high speed. Thinking about buying one? Yes is the answer. I had forgot how much I loved having a steering stabilizer until I went without one for most of last season and the start of this season. They are worth their weight in gold!! It has saved me from a few trips to the nurses office. I will hopefully never have to ride without one again. One of the best things to have on your dirt bike!! Had this same set up on my 200, love it. Install isn't easy (never mind the strapping the forks nonsense in the instructions, just take them off the bike) but once the tower is in place, you're set. I really like the product. Not cheap, but it's excellent if you can afford it. Can really tell the difference. Wouldn't want to ride without it. Love my new Scotts Stabilizer kit! New parts are great and installation was trouble free. Easy to follow instructions. Definitely glad I went with the Scotts. Installed on a 13 250sx and it has already saved me a couple times. I like that its not noticeable in the tight and technical areas but if you catch a root or rock at an angle I can feel it kick in. Having this on has helped my confidence to ride faster through the wood because I know a weird bounce wont send me off the trail. Works well on the moto track as well especially in sand sections. In hindsight I would have gotten the above the bars mount, and I probably will end up buying that mount. I just don't like how tall it makes the bars, and I'm 6'3", the rise just seems to change the ergonomics of the bike even though it doesn't effect my riding ability. My sons confidence went up when riding high speed in washes. He rides desert and track. I had a little trouble with the factory welds . Had to file some to get a flush fit on the base .Got more instructions form a utube from europe than scotts on that. RMC should do a video . Gives a lot of stability to the bike in soft/slick terrain. Easy install and works great. Saved me already a couple of times with off angle roots and ledges. Made my bike more stable and easier to ride fast in sand, and loose soil. It definately gave me more confidence at speed, and is barely noticeable in the slow speed single track. I love these dampers! This is my 3rd scotts and if you ride harescrambles you need one. They last forever and if you changed bikes next year just get a new mount and take the damper with you. My only slight with this kit was that it made my front brake line a little tighter than I like. So I will be ordering a +1" braided line next. The kit was relatively easy to install and has great instructions. This Kit will not fit with Cycra Center reach hand guards FYI. 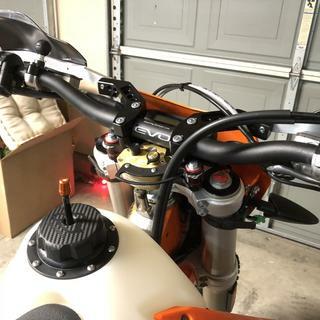 I ended up buying different handlebar top clamps by BRP that are meant for mounting with cycra probend hand guards. I tested the set up last week in the Mojave desert of California and it performed excellent! Makes a huge difference in the sand with noticeably less headshake. Excellent product, increases control and lessens fatigue. I can't really rate the durability I have only put 5 hours on the damper. Great damper. Works better than expected in sand and keeping my front end going the direction I want. Will put on all future bikes. Bought this to help with root / rock deflections and heavy sand. Bolted up without issue. Set it to stock settings. On more than one occasion, this has saved my bacon by causing the bike to just jump sideways and stay on line rather than ripping the bars from my hands and throwing me to the ground. I love this stabilizer. Installed on my 2014 wr450f. Made a huge difference in the bikes handling. If you ride rough trails, this thing is a game changer. Highly recommended. Does everything it claims to do, best insurance policy you can buy besides a quality helmet! Excellent quality and fitment! Pretty much eliminated my head shake, great product! All I can say is if you do a lot of woods or single track riding it is a must! This thing has saved me numerous times already its crazy. It has a higher selling price than the GPR stabilizer but the Scotts Performance stabilizer is capable of fine tuning. Quality and adjustability are the reason I forked out extra cash. It hurts to be cheap, when you're flying wide open thru the desert! My setup came with sweet BRP mount that fit my protapers! Wow this thing is sweet, everybody needs one! Easy to install and unbelievable performance. this makes off road riding a lot more comfortable. Definitely will have these on all my bikes from now on. Great product, easy to install! Cannot believe how much difference this has made to an already great bike. Raises bars more than a 1/2", but I like that I'm 6'2"
Fit was awesome, install very simple with clear instructions, raised the bar up to where I needed it as a taller rider. Only negative is that I installed it just before a race and my throttle cable catches on the stabilizer. Definitely need the optional cable guide. For the price of it this should really be included. 1 ride and im hooked! Should have done this on my 300 a long time ago. I ride a lot of mixed terrain around Washington including some desert racing/riding. I've had. Hard time getting really comfortable on this bike at faster speeds and longer distances. The damper really let's me relax my grip a bit and uses less arm energy overall. The build quality is impeccable and the install was a total no brainier. The under mount is super lean and I wanted a little bar lift anyhow. These steering Dampers work wonders. I never knew what I was missing till I rode a friends bike that had one on it. Really makes a difference in how your arms feel/ arm pump. I feel much more confident in rough areas at high speeds. I ride with it really turned up high, not scared to hit anything in the way anymore or having the bars accidentally ripped away from me. Easy fitment all hardware was included. Underbar mount keeps it out of the way nicely. Outstanding improvement in control. Love the unit. Makes the front end stay where I point it to especially over loose rocks and roots, and does a great job at high speed also. Its quite expensive but all stabilizers run at nearly the same price point. Seems extremely well built, offers many adjustments to suite your riding style. Installation wasn't all that bad except the part were it asks you to tap down the clamp onto the steering head. Mine never fully seated to what they described after trying 5 different times. Overall very satisfied with the purchase and seems to let me run faster in certain sections than I could before the install. I do a lot of riding in central florida in deep sand and this stabilizer really helps. It was easy to install, and so far still looks really good even with a fair bit of abuse. I really like how easy it is to adjust the tension while riding too for different conditions. Easy to installs and works perfectly. I have put 4 rides with this stabilizer and I have no complaints and would recommend this stabilizer to anyone. Will this fit with the Fastflex bars? BEST ANSWER: Yes the sub mount kit will work with the flex bars. Would these Bykas bar shocks work with a Scotts stabilizer sub mount kit or top mount kit? BEST ANSWER: Both the lower and the upper Scotts performance top will not work. The Bykas bar shocks are just too wide the sub mount stabilizer will not fit between. The top mount stabilizer kit in combination with the Bykas raises the Scotts stabilizer too high the link arm will not reach. Will these work with Cycra pro bend center mount handguards? BEST ANSWER: Yes, the upper bar clamps retain the stock spacing etc. Any handguard mount that attaches to the bars or the upper bar clamp should work as intended. 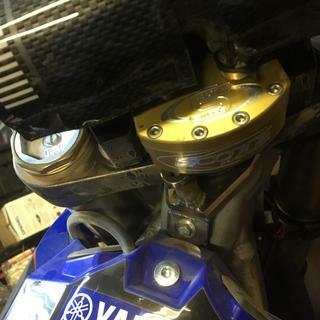 The Sub Mount raised the bars 30mm on my YZ450 so you may want to run a shorter bar with the Sub Mount. The Scotts Sub Mount is a really nice kit. I don't see why not. I don't have Cycra's on my bike but do have them on my Daughters and looking at how they mount and how the stabilizer mounts I don't see where there would be a problem. Yes it will definitely work. I purchased both the Crycra Ultra Probend and the Scotts Performance SUB Mount about a month ago and they work great together. Great Setup. Hope this helps! yes they will still work and allow the customer to mount both items to the bike. the hand guards will be close to the bar clamps for the triple trees but it will still work. Does this kit bolt on to my 2008 KTM 450 XCR-W without modification to the top triple tree? BEST ANSWER: raises your Bars if your ok with that, it replaces your current handle bar mounts and bolts on. Will this fit a 2018 KTM 500 EXC-F while using stock cables? BEST ANSWER: The bars will be raised by 1" from the stock setting. You shouldn't need longer cables. ride a lot in the woods. Will this help me ? BEST ANSWER: Yes, I ride both desert and woods here in Colorado, and I feel it's a great addition in the desert but a blessing in the woods. When the front tire hits the side of a hidden rock or a diagonal root the tire will not deflect and will help keep you going forward and not sideways. Just make sure you turn the adjuster on the stabilizer down a few clicks for tight woods riding compared to the setting for desert. Well worth the money in my book. Good luck. I never race but I love mine. I ride a lot of rocky trails and it is amazing for that. Keeps the bar turning hits under better control. On loamy woods trails I don't notice it. But to me that is the art of making a good product, one you don't notice until it is needed. It really shines for me on long high speed stretches where the front end no longer wonders. It never wobbled but would hunt slowly for a line. With the stabilizer it just goes where I tell it too. I've had this on my WR450F for a couple years. I mostly ride woods with lots of exposed roots and sand. I've had a couple of crashes from root deflections prior to the stabilizer. After adding the stabilizer, the bike will just jump sideways and keep going straight. It's really a weird feeling, but you know you were just saved. This also helps when riding in sand with the steering jumping around. I'm glad I spent the money for it. For me anytime I ride woods in 2nd gear and above it think it helps greatly. I ride east coast SETRA and SORCs. Some tight woods some not so tight. In the really tight 1st gear stuff I feel the resistance (you can turn it down if you want to) but once things open up a bit and I can get out of 1st is when I really appreciate having this installed. Has really helped me drop some of my previous loop times. I ride everywhere from glamis sand dunes to deep forest in Northern California. A stabilizer helps everywhere and once you start messing with it you will find the right setting for your riding. At first I didn't really mess with the settings and now I adjust it as I ride you just get a feel for it. So short answer yes you will benefit from it in deep wood riding. 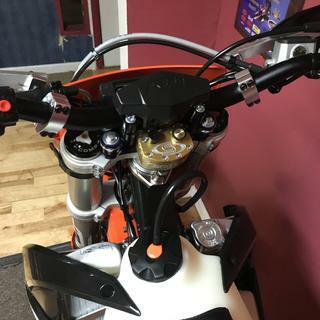 I had never owned a bike with a stabilizer before I bought my new KTM 350 and I finally went for the investment and I have to say that I love my Scott's stabilizer. I ride mostly single track in the mountains and some desert the stabilizer keeps the bike straight through all the bumps and rocks. I will have a stabilizer on every bike I own from now on! This stabilizer will help you hold your line no matter where you ride. It will dampen the steering for anything that makes your bars jerk your arms around. Love it for climbing, especially if it's rocky. Worth the price in the long run, especially if it helps you stay on the bike. Keep it when you sell your bike and put it on your new ride. Absolutely!!! I am 36 and mostly woods ride. I wish I tried one out years ago. I put it on my 2016 KTM 500 EXC and will never ride a bike without one. It reduces fatigue and makes loose rocky sections a breeze. I do turn it down a little in tight switch backs. Absolutely! I put mine on a YZ250 that is primarily a woods bike. It significantly reduces the tendency of the bike to want to rip the bars out of your hands when you are hitting irregular surfaces/rocks/tree roots/etc. it most definitely helps in the woods. A sudden deflection off a rock or root can be disastrous. A good steering dampener is cheap insurance. One trip to the emergency room is much more expensive. Been riding 40 years. Purchased one a year ago, really helped me with Arm and upper body fatigue. Start out with the recommended settings and slowly adjust it until you get it the way you like it. I play ride more than I woods race... It's the first thing I install on a new or used bike. It is money well spent. After you ride with one (play ride or race) you will love it. Absolutely. Helps keep the bars stable in rocky, rooty, and rough situations. The high speed damping is a life saver if you happen to catch a tree with the bars as well. I love mine. It helps even more in the woods. I ride moto and woods. It takes all the fight out of roots and ruts. Once you ride with one you'll never ride without again. Yes it will ,especially in rocky and sandy terrains,allows you to ride with more confidence. It can be helpful, especially in rocks and mud. does this one have the rubber mounts? BEST ANSWER: It comes with two different sets of polyurethane bushings. They cut down on the amount of engine vibration felt through the bars. Red are firm, blue are softer I believe. Yes, it comes with a red set and blue set which are different softnesses. These are between the handlebar mounts and bracket that bolts to the top triple tree. This is not a new triple clamp. It uses the existing triple clamps and mounts under the bar. So no rubber mounts. yes, it comes with more than one set. you can see the rubber mounts in the picture of parts. The one for ktm 690 includes two different sets, one being firmer than the other. No it does not. BRP makes the one with the rubber mounting system. This unit is all hydraulic, no rubber pieces involved. Mine where solid rather than rubber. Hope this helps! No, BRP mount w/Scott damper does though. Does this kit include the actual stabilizer or is it just the mounting kit? BEST ANSWER: If you order Part # 1580060040 it will come with the actual Scotts stabilizer and the submount parts. I ordered the whole kit for my 2017 KTM 500 EXC-F.
its the whole kit. Everything you need. will this come with the BRP sub mount? BEST ANSWER: I'm pretty sure its a scotts sub mount, but yes it comes with everything u need to mount it under your handlebars. Just keep in mind though that it raises your handlebars about 3/4 to an inch. Yes, it does. Mine came with the BRP flexible sub mount kit and all hardware needed to install. Yes it does. Everything I needed to mount it to my 2017 KTM 500EXC-F was in this kit. This is a complete kit for mounting the stabilizer to your steering column. I bought the kit for my Husky 701, and it came complete with all I needed. How heavy would it make my 2017 yz450f feel? The weight of the standard damper kit is about 2lbs and the sub rubber mount kit is about 3lbs. You will not feel the damper weight when mounted on the bike. Please call us with any other questions. The weight of the unit itself is un-noticeable. The dampening can be turned up too high which will make the bike feel very sluggish. I only use 3 to 6 clicks above zero on my CRF450. Any more makes my bike heavy feeling. It's adjustable, from zero no effect to heavy damping. Helps minimize fatigue on rough and stabilizes on highway, you dial in what feels good. Honestly, it didn't affect the feeling of the weight of my bike too much. It's probably 2-3 pounds in weight as a system but it's not huge. Should not make your bike feel heavier for any reason. Ive been running this setup on my bike for over a year and its great! No heavier than it is now. I didn’t notice the added weight at all. Any way they can be used without raising your handlebars? BEST ANSWER: I’ve always went with a lower bend handlebar to make up the difference. The CR low work just fine and making up the difference. The only way is to get a top mount stabilizer. How much does it raise the bars on a honda 450x ? BEST ANSWER: The SUB mount raised the bar clamps 30mm. I compensated by going with a shorter bar than I normally run. The SUB mount is really nice. I would highly recommend over the standard mount where you could possibly impact the stabilizer in a crash. 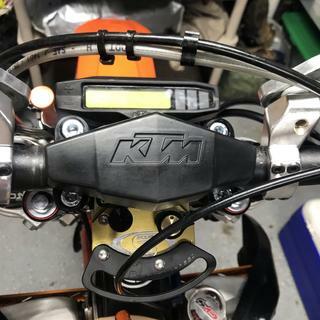 I know it's not the same bike, but the mount bracket added about 1" on my WR450F. Roughly equivalent to my Tusk 30mm bar risers. I'd imagine it's pretty similar for the 450x since the goal is to clear the stabilizer which is the same size. About half an inch to an inch. Not too much. some of the fluid leaked out of my stabilizer . What is the fluid in it exactly? BEST ANSWER: The fluid is oil. Steering dampers use restrained oil flow to control excessive movement of the handlebars in a way similar to how your shock uses restrained oil flow to control excessive movement of your rear wheel. The oil seal(s) have failed and you will have to rebuild it, or send it in for a rebuild. Instructions on rebuilding it yourself can be found on the Scotts website, as well as info on how to get it serviced by them. Your local dirt bike shop should be able to help. Also, there are you tube videos and a pfd from Scotts with oil changing instructions. 2.5 Weight Suspension Oil is what they come with from the factory. BEST ANSWER: Bars can be ran in #2 or #3 position. It'll raise the handlebars 1 inch. You should be fine if you're already running the bars 1 position forward from stock. Go ahead and get the throttle cable guide as well if you decide to get the stabilizer. 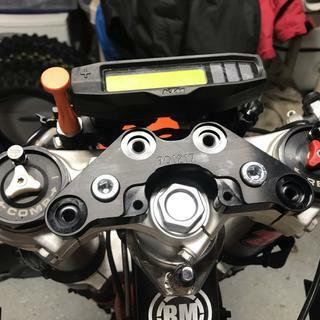 I have this installed on a 2011 WR450, the mount can be used in the standard position or rotated to allow the bars slightly forward of standard. Check out the install document on SCOTTs web site they show pictures of both. I have a 2017 FE450 and it is mounted in the rear position. Will not mount in the front position. You should be fine, plenty of room on my XCF. Awesome set up , you will be pleased. Will this work with the 3 gallon aftermarket fuel tank on a 2015 wr450f? BEST ANSWER: It’s works for my 2016 yz250x no problems. I’m not sure the frame differences between the yz and wr. Yes, I installed a 3 gallon IMS tank the sun mounts fits fine. I have a desert tank on mine and it did not interfere. How much will this raise the bars on a 2015 Yamaha WR450? BEST ANSWER: I can't answer with regard to the Wr450. On my 2016 KTM 690 R, it raised the bars aprox. 1/2 inch. The purchase was money well spent. YMMV. Looks like 1 1/4”. Hope this helps. 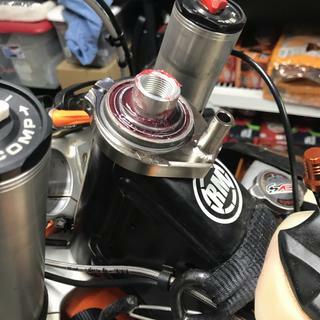 Will this fit a 2006 KTM 300 XC? Fitment list only goes back to 2008. 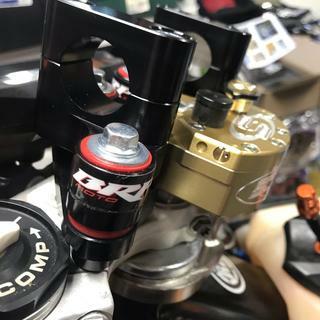 BEST ANSWER: I'm not sure on that but I have it for my WR four 52,017 and I love it or you have another Scott steering dampener on my race bike which was an EXR 650 yard it was a 2001 I'm pretty sure that they have some kind of mounting bracket for it I guarantee you're going to love itEnter an answer to this question. My brother has used the same mount for his bikes all the way back to 2004 or so. He has had two different Honda's and two different Yamahas, I'm pretty sure that it will work. It also fit my 2004 Honda 250. I say go for it, they seem pretty standard for every bike. 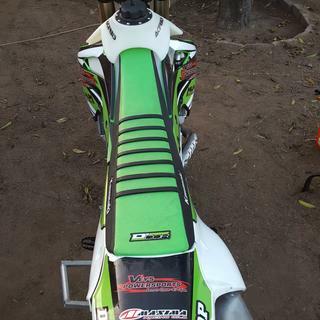 does this raise the bars on a 2016 kx250f ? BEST ANSWER: Brian, I put a stabilizer on my 2014 Ktm 350 SXF and it did not raise the bars up higher. I know we have different bikes but it shouldn't make a difference. Hope you enjoy your stabilizer as much as I do. Keep the shiny side up. 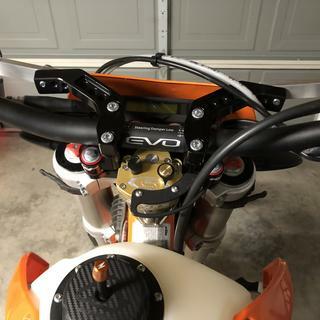 How much will the sub mount kit raise the bars on a 06 CRF 250X, and will my cables still be long enough? BEST ANSWER: I can't say for sure about the CRF 250X, but on my WR450F, it raised the bars about an inch. Close to the same height as the 30mm Tusk bar risers. Again, I can't say for sure on the 250X, but most bikes I've seen have long enough cables to reach without binding unless you've put some really tall bars on in addition to risers. I had plenty of cable length on my WR. Always check for binding or pull by putting the bike on the stand and starting it up. Turn the bars full left and full right a few times to be sure the bike doesn't rev up which would indicate a bind requiring a longer cable. You may find that routing the cables differently will give you more length as well. On my Wr450 it raised my bars ~10mm, and all my cables fit with no problem. I was considering bar risers already so having the sub-mount raise mine was a two-for for me. Yes our damper will definitely help with the bar vibration and any movement left to right in the handle bars. Please check our website "Scottsperformance.com" or call us at 818-248-6747 and we can answer any questions that you may have. WHY is this not available for 2018 crf250r? It is available for the 2017 and I can’t tell any steering changes! BEST ANSWER: They are different mounting systems. And we cannot guarantee they will work where the manufacturer does not list them to work. I apologize for the inconvenience. Will this fit a 2019 Husqvarna FE 501? As far as I can tell this fits the 2018 models and there don't seem to have been any changes to the 2018 models going forward to the 2019 models. will this fit on my 2018 dr 650s? BEST ANSWER: Unfortunately, we do not carry this part number. Which model if any will fit an 09 YZ450F? Will this fit a 2017 yz250x with an Acerbis oversize tank? BEST ANSWER: Yes they will fit together. Anyone confirm this? No mods needed? Also with the oversize tank, can you still get to the plug or do you have to take off tank? Do you have a install video on the Scotts Performance SUB Mount Complete Stabilizer Kit ? Do you think you would sell more if they looked at a video and said, Hey I can do that. Does the top clamp keep the same bolt pattern/ spacing as stock? I have a HDB one piece top clamp id like to use with this. BEST ANSWER: Yes, this item will fit and match all the stock components. 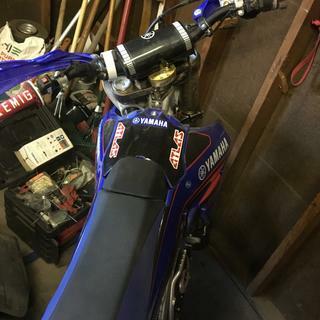 I have a 2012 yamaha wr450f with stock bars and triple clamps. I also am running bar risers. Will adding this kit make my bars even higher? I am 6'4" with long legs and short arms so some added height would be welcomed. BEST ANSWER: The sub mount kit raises the bar up 1 inch. You can run bar risers on top of the sub mount as well for added height. You just need to be cautious as to how tall you make it. At about 3 inches the throttle and clutch cables may become to short. will this scotts steering stabilizer fit a 2015 ktm 350 xcf-w ? We make both a top and sub mount option for this bike. You can go to this link below and see the kits there.